Footwear. Web catalogue. Footwear industry, exhibitions of footwear, shoe news, magazines and websites. Web catalogue of footwear is created for everything which are engaged and interested shoe business in Ukraine and behind its limits. Women's heels are the most popular model of any season. They perfectly complement casual and festive looks. 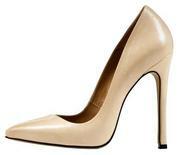 Beige color and high heels make silhouette visually slimmer, sleeker and more attractive. You can wear them with different dresses, skirts, pants. Your clothes may be different but your beige heels will be always with you.